Aiden Moffat – the BTCC’s youngest ever driver – produced a mature defensive masterclass to win the opening BTCC race at Brands Hatch. Tom Ingram and Ash Sutton finished second and third, edging them closer to the Independents’ and overall Drivers’ titles respectively. Pole-sitter Jack Goff endured a dramatic start as his Honda Civic Type R slid wildly through Paddock Hill Bend on the greasy conditions. Having the unenviable task of being the first driver to run on the damp surface through one of motorsport’s most daunting corners, Goff lost control and his Eurotech Racing car ended up in the barrier. Moffat inherited the lead and maintained the position for the full race distance, but the flying Scotsman’s came under intense pressure throughout from Ingram and Sutton. Championship leader Sutton initially held second before Ingram’s Toyota carved past on the exit of Clearways on lap five. The trio remained inseparable for the remainder with the pace fluctuating between them. 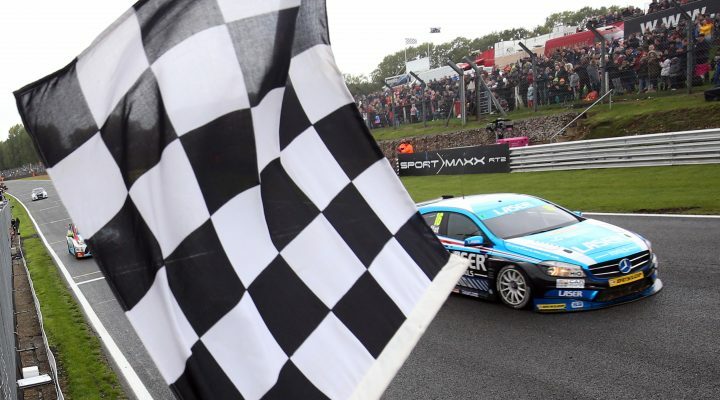 Several passing attempts were made but the positions remained the same until the finish, as Moffat impressively secured his second BTCC career victory. “It’s a great way to end the season and a nice belated birthday present,” said 21-year-old Moffat. “The Laser Tools guys and the Ciceley Motorsport mob gave me a great car – it’s felt brilliant all weekend. It was hard in those conditions, getting into the lead and becoming the guinea pig. It’s about being cautious and not leaving yourself open to getting passed. I love those kind of conditions, though. I like the car moving and I’m comfortable with that. Mat Jackson claimed fourth for Team Shredded Wheat Racing with Duo as his race was made slightly easier when Handy Motorsport’s Rob Austin spun out of contention behind him. Vauxhall claimed manufacturer honours in the race as Tom Chilton held off Power Maxed Racing team-mate Senna Proctor to take fifth. Outgoing BTCC champion Gordon Shedden grabbed seventh, from 16th on the grid, and also took an extra championship point for fastest lap. BTC Norlin Racing’s Dave Newsham had some nervy moments in the early laps but the experienced racer still scored a very credible eighth, ahead of the recovering Austin, whilst Halfords Yuasa Racing’s Matt Neal rounded out the top ten. The overall championship picture took a turn for the worse for Team BMW’s Colin Turkington as he could only manage 15th and a solitary point. The BMW 125i M Sport seemed to struggle for grip as the rain drizzled down and the Ulsterman even lost a place on the final lap as contact with Mat Simpson’s Honda let the AmD Audi of Ollie Jackson through. Adrian Flux Subaru Racing’s Sutton now holds a 24 point advantage over Turkington in the overall standing with 44 still on offer over the remainder of the day. The action is LIVE now on ITV4 and will be throughout the day as the destiny of this year’s title is decided.